New research shows some of Europe's dirtiest energy companies still have highly privileged access to the European Commission, despite the global agreement to tackle climate change. April 22, New York City. More than 170 governments put pen to paper in the official signing ceremony for the Paris Agreement – the fruits of last December's UN climate talks, also known as COP21. EU Commissioner for Climate and Energy, Spain's Miguel Arias Cañete, claims to have had a key role in securing the 'historic' deal. Whether you agree with it being historic or not (see box below for brief analysis), proponents claim the 'Paris effect' marks a shift towards a clean energy future. So surely this would mean that Cañete and his boss, Vice President for the Energy Union, Maros Šefčovič, now in the job for a year and a half, would be focusing on a future of renewable energy and energy efficiency, and stop affording privileged access to the very same corporations responsible for the climate crisis, namely the fossil fuel industry? Unfortunately not. Six months on from the one-year anniversary of taking office and CEO's report 'Cooking the Planet since 2014: Big Energy's year of privileged access to Europe's Climate Commissioners', research by Corporate Europe Observatory into who the Commissioners and their cabinets have been meeting, particularly since leaving Paris, shows little has changed.i Neither in who is enjoying privileged access nor in the EU's push for more fossil fuels, despite claiming we now live in a 'post-Paris' world. Since the “historic” agreement, the EU has backed down from increasing its ambition to meet its Paris commitments, has pledged to massively expand natural gas supplies – both conventional and fracked gas – and continues to place free trade deals like the one being negotiated with the US, the Transatlantic Trade and Investment Partnership (TTIP), before the climate. In addition, Cañete himself has also been embroiled in a series of scandals, including the tax evasion revelations in the Panama Papers and fraud accusations, adding to the long list that existed before he was Commissioner. The end of COP21 was greeted with self-congratulatory backslapping and applause as world leaders rejoiced at bringing all countries on board with a deal that was supposed to tackle global climate change. But what was in the deal and was it up to scratch? No legally-binding targets: Despite the widely-heralded goal to keep temperatures '“well below 2°C above pre-industrial levels and to pursue efforts to limit the temperature increase to 1.5°C”,ii there's nothing in the text that makes it legally binding. Instead climate action is supposed to be underpinned by the 'name and shame' tactic. Current voluntary pledges set us on course for more than 3°C warming. No timeline: To keep to 2°C, let alone 1.5°C, requires drastic emissions reductions today, yet the timeline countries agreed was to peak global emissions “as soon as possible”. No move away from fossil fuels: Instead of pledging to keep fossil fuels in the ground, governments inserted a loophole which would allow emissions to keep rising as long as they were 'balanced out' by sinks (which covers anything from tree-planting to sucking CO2 out of the atmosphere with risky experimental technologies). New carbon markets: The deal opened the door for a new international carbon market to allow rich countries to offset their emissions rather than taking immediate action at home. 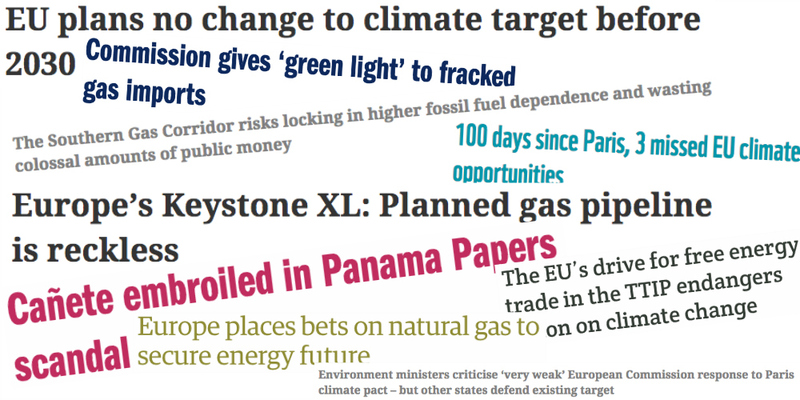 In short, Climate: 0, Big Polluters: 1.
Who's been meeting the Commissioners in this 'post-Paris' world? A look at all lobby meetings involving Climate and Energy Commissioner Cañete, Vice President for Energy Union Šefčovič or their cabinets since the Paris Agreement was signed shows no signs of going against Big Energy or avoiding yet further fossil fuel lock-in. So much for a ''post-Paris world' or the existence of the 'Paris Effect'. Out of the 163 meetingsiii with 170 different lobby groups (excluding public authorities), 71 per cent were with industry, 17 per cent with NGOs, 8 per cent were with think tanks and research institutions and only 5 per cent were with trade unions. It is possible to see which type of stakeholders – and even which industries – had the most meetings with the Commissioners, but narrowing it down to individual organisations or companies is more tricky due to the way the Commission records its interactions with lobbyists. Each Commissioner and their cabinet has their own calendar, and lists each interaction with each stakeholder, so a single meeting with multiple stakeholders may appear multiple times in multiple calendars. For example if Airbus and Boeing met Cañete, Šefčovič and one cabinet member from each Commissioner, it would appear twice in four separate calendars, given the impression of eight separate meetings rather than a single meeting taking place. To make things simpler, we've labelled each occurrence as an 'encounter', which crudely translates to face time with officials, ie if EURELECTRIC has four encounters with the Commissioners, this could be one meeting with four officials, or four separate meetings with one official, or a combination. Which industry lobby groups enjoyed the most face time with top climate officials? The list of industry players who have had more than two encounters with the Commissioners or their staff includes the likes of aircraft and arms manufacturer Airbus and oil and gas companies Gas Natural Fenosa and Statoil: out of the twelve, seven represent the fossil fuel industry, two represent aerospace, one the electricity grids and only one from the renewable energy industry and one representing electric vehicles (National Grid PLC is also a gas distributor, and has therefore been classified as a fossil fuel interest). It's worth highlighting Airbus in particular, who enjoyed four encounters with Šefčovič and/or his cabinet. They are an active member of lobby group the International Aviation Transport Association (IATA) who was instrumental in keeping aviation out of the Paris climate negotiations,iv despite being one of the fastest growing sectors of CO2 emissions (set to grow by up to 700% by 2050). Instead IATA and the global airline industry want to use offset their emissions via protecting forests under the REDD+ scheme, notorious for land grabs, financial speculation and social- and environmental abuses, without curbing emissions. Rather than accepting that emissions the world over need to be cut if we're going to tackle climate change, they want to keep expanding, and have had the idea adopted by the UN's notoriously industry-dominated International Civil Aviation Authority (ICAO). More than 80 NGOs, including Corporate Europe Observatory, signed a joint declaration publicly opposing the plans. If ICAO does not come with effective plans to reduce emissions at their September 2016 assembly, the EU will propose new regulations before the year is out on how to strengthen the regulation of aviation emissions in Europe. Expect a lobbying frenzy. The two most popular guests from the energy sector, with four encounters each, are EURELECTRIC – representing Europe's energy utilities, shown to be some of the most regressive climate laggards on the continent – and the Trans Adriatic Pipeline, a corporate consortium pushing for the highly-controversial Southern Gas Corridor which would waste billions on gas infrastructure locking Europe into another half a century of fossil fuels. Security of gas supply and a liquified natural gas (LNG) strategy: the current proposals threaten to lock the EU into another 50 years of fossil fuels by investing in yet more gas infrastructure despite their being no demand and despite it being potentially worse for the climate than coal. A re-design for the electricity market: it could potentially support renewable energy, but industry is lobbying for it to 'not choose winners', while compensating fossil fuel power plants to remain closed so they're ready “just in case” renewables can't deliver. On renewable energy and energy efficiency: the currently weak 2030 ambitions could be increased, with both policies proven as the most effective ways to reduce CO2. However, the push for gas threatens to undermine this. Keeping the failed European Emissions Trading Scheme on life support: the EU ETS is being reformed but the now-customary lack of ambition means it will continue to hold back real solutions to emissions reductions while compensating the biggest polluters. Non-ETS sectors are also being reviewed. While some are claiming that all of these provide the opportunity to shift away from fossil fuels towards decentralised energy powered by the wind and sun, unfortunately the most regular industry visitors want to ensure business as usual. Even the renewable energy lobbies have been increasingly been shown to be captured by the fossil fuel industries, with members including the likes of oil and gas behemoths Total and Chevron into politically important positions, leading them to promote fossil fuels when lobbying the Commission while limiting their own ambition. The absence of renewable energy and energy efficiency companies meeting the Commissioners contradicts the politicians' own post-Paris narrative. It is even more remarkable as the Commission is due to present new renewable energy and energy efficiency proposals later this year. 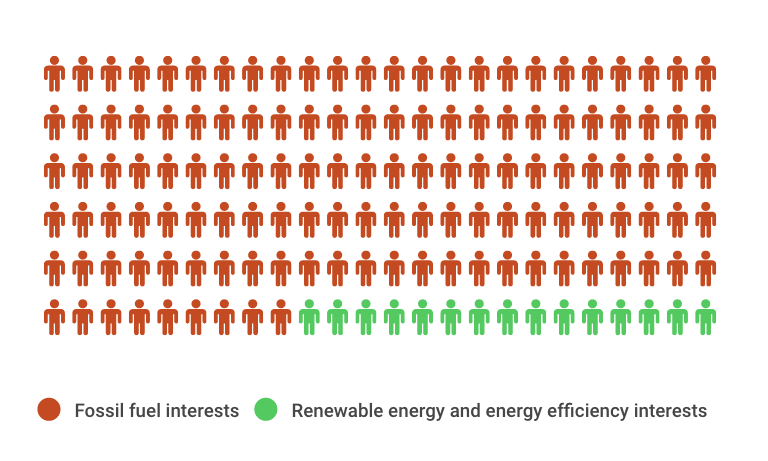 Since the Paris Agreement was signed, there have been 55 meetings with fossil fuel interests while only 7 with renewables and 2 with energy efficiency interests, so a ration of 6:1. This is even more worrying when taking into account that the two main renewable industry lobbies in Brussels, SolarPower Europe, and WindEurope, have been lobbying for natural gas. The close relationship between the European Commission and the fossil fuel industry isn't just a debate about privileged access, it has real world implications in the fight against climate change. Rather than championing wind, wave, and solar energy sources as a way to power the necessary low-carbon transition, the Spanish ex-Minister Cañete announced at the EU-OPEC energy conference that oil was “an indispensable source” for Europe and will continue to be so for years to come, while any shift away from fossil fuels “will not happen overnight”. The recent Winter Energy package announced by the Commission in February was supposed to focus on renewables and efficiency but was dubbed the “gas package” due to the over-emphasis on gas. It outlines a strategy to increase domestic production, including from unconventional sources, ie fracked gas. However, according to the projections, this will almost exclusively come from the UK, whose population has consistently opposed the practice despite unrelenting industry and government campaigns to promote it. But the UK is not alone in resisting fracking, with Europeans consistently against the practice due to the local environmental impacts, poisoning water tables, and threatening local agriculture and drinking water. The impacts on the climate can also be far worse than even coal, due to the methane leakage during the extraction process, meaning fracking is not going to create local economic development or tackle climate change. In fact quite the opposite. But it's not just domestic supplies that Brussels is interested in: the ongoing EU-US free trade talks (the Trade and Investment Partnership, or TTIP) aim to increase the amount of fracked gas sent here from the US as LNG (liquefied natural gas). And to top it off, the plan is to bring yet more gas to Europe through pipelines such as the South Corridor. A turn towards natural gas mirrors the demands of the oil and gas industry, both before and after Paris, which claims natural gas is a 'clean' fuel that should be a permanent part of our energy mix, complementing renewables. The gas industry is well represented in meetings with Cañete and Šefčovič. Aside from the regular guest Statoil, Gas Natural Fenosa and the Trans Adriatic Pipeline consortium, BP, Centrica, E.On, EDF, ENAGAS, Endesa, Enel, Engie, Fortum Oyi, Gazprom, Iberdrola, Shell, Snam, SOCAR, and Trafigura have also been to visit the Commissioners since Paris. As well as market design and the Southern Gas Corridor, meetings were also on carbon capture and storage, the EU ETS, and renewables policy, among others. 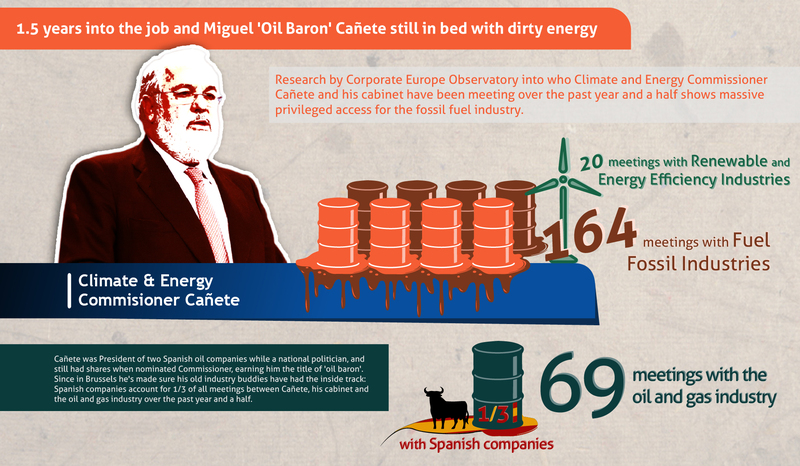 Cañete arrived in Brussels shrouded in scandal due to holding shares in two oil companies that he used to be the President of, but handed over to his wife's family (she and her brothers were recently named in the Panama Papers exposing offshore tax evasion). Since arriving he has gone to special efforts to win over civil society, but his past has come back to haunt him, with his name being mentioned in a corruption case surrounding the awarding of irregular construction contracts while he was Agriculture, Food and Environment Minister in Spain. The statistics of stakeholder meetings since Paris show the worrying trend unearthed by Corporate Europe Observatory last year has not stopped. Research into meetings during the first year in office for Commissioners Cañete and Šefčovič showed 80 per cent were with the private sector, with dirty industries enjoying particularly privileged access The figures for 1.5 years look remarkable similar: Since taking office, Cañete, Šefčovič and their cabinets have had a total of 779 separate meetings (methodological problems withstanding) with non-public stakeholders on topics ranging from the aviation package to reforming the European Emissions Trading Scheme to the circular economy. 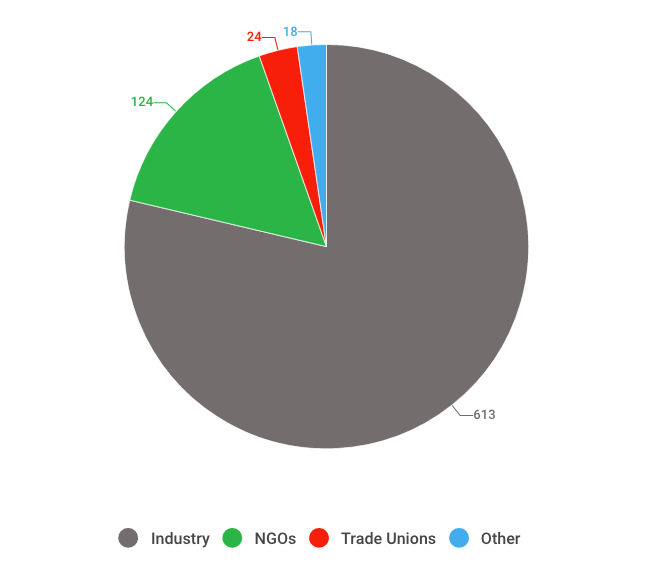 Almost 80 per cent of meetings are with industry interests, while only 16 per cent are with NGOs. That means that industry still enjoys five meetings to every one with NGOs. Many NGOs have been pleasantly surprised at the access they've received under Cañete since he took office. In the five months since Paris, the European Climate Foundation has had eight separate meetings, more than any other entity, while Climate Action Network Europe (CAN-E) leads on meetings when measuring from when Cañete took office, with 16. But such a narrow selection of stakeholders will undoubtedly exclude many voices who may not agree with the mainstream policy positions being taken, as was the case on the EU ETS where there was little engagement with organisations fighting for climate justice and representing those being most impacted by carbon trading. Some of the big green NGOs in Brussels have seen their meetings increase dramatically, but the overall figures – five industry meetings for every one with an NGO – show the problem can't be solved by increasing access for a few organisations, and reflects the structural imbalances between actors in Brussels. Focusing on balance also avoids a fundamental point: should the Commission be that close to the fossil fuel industry at all? The Commission is under a legal obligation to keep the tobacco industry away from policy making on tobacco control, thanks to what is known as 'Article 5.3' in the UN framework convention on tobacco control, and many have been pushing for a similar measure to tackle the fossil fuel industry and other regressive climate forces. Those same industries who have been exposed on multiple occasions to be lobbying against climate policies should be kept at arms length in order to protect independent policy making. The lack of representation for trade unions is equally stark. They have had one meeting for every 26 by industry. If the Commission is serious about transitioning away from dirty energy then workers – both those in current industries to be wound down as well as those working in and being trained in new ones – will need to be at the heart of any process, ensuring it is socially as well as ecologically just. The Commission needs to re-evaluate who it is meaningfully engaging when making policy, and take a proactive approach to reaching out to trade unions and other public interest groups while keeping those lobbying against progressive policies at arms length. The overall figures for renewable energy and energy efficiency access are embarrassing for Commissioners who have talked up both energy efficiency and renewable energy. The climate Commissioners and their cabinets have had 258 meetings with fossil fuel interests, and only 29 with renewables and energy efficiency interests. The priority given to the oil and gas industry can be seen by the privileged access they've enjoyed since the new Commission has been in office. They have had more than four times the meetings enjoyed by the renewable and energy efficiency industry interests, 122 vs 29. Little has changed in the behaviour or outlook of either European Industry and their lobbyists or the Commissioners themselves. But given the importance of the dossiers being discussed, and the known track-record of shady lobbying by many of the companies involved, we need to kick big polluters out – at all levels – and hold public officials to account. The meetings were worked out through creating a 'tag' for each encounter (ie each time a stakeholder might appear in someone's online, public calendar), combining it with a date and the subject of the meeting and hope that it corresponded. This has also led to a weakness based on human error, as in one cabinet member calendar the subject of the meeting might be slightly different from the others, therefore leading to it being recorded as two different meetings. However, given limited resources and the varying quality of the data, it is the best that can be hoped for at the moment. Uniformity is needed in how events are recorded before the data can be fully utilised. Human input is key for the project but also its downfall, as for example when Šefčovič's cabinet member Manuel Szapiro took 5 months to fill out his appointments. Cañete himself was 2 weeks behind when the information was extracted. For the sake of the article and to ensure we were able to analyse the information available, we decided that 3May 2016 would be the cut-off for collecting raw information. As much of the information on stakeholders is cross referenced with a database from the Commission's Transparency Register, therefore the variation in quality of data in that register further impedes the work. iThis study has chosen May 2nd as its cut-off date, which marks the 1.5 year anniversary of the two Commissioners taking office. All calculations were based on the information publicly available on Commissioner and cabinet calendars on that date. Any meetings added since then have not been included. Equally, methodological difficulties due to the way the Commission records data may increase the margin for error (see methodology box). iiiThe calculations were based on the available information on Monday 2 May 2016, and any meetings added since then have not been included. Equally, methodological difficulties due to the way the Commission records data may increase the margin for error. vAccording to climate scientist Kevin Anderson, the European Union should be aiming for at least an 80 per cent reduction in emissions by 2030 if it takes into account its historical accumulative emissions, as well as providing financing for other poorer countries to reduce their emissions. Tell World Leaders to Kick Big Polluters out of Climate Policy!